She had been giving evidence against her killer after he called her a \”terrorist\” in a playground. Ms Sherbini was stabbed 18 times by a 28-year-old Russian identified as Axel W, who leapt across the courtroom during an appeals hearing and attacked her in front of her husband and son. Ms Sherbini\’s husband was attacked by the assailant as he tried to defend his wife and was also accidentally shot by German police. The Egyptian media have expressed outrage, asking how the incident was allowed to happen and dubbing Ms Sherbini \”the martyr of the Hijab\”, in reference to her Islamic headscarf. On Tuesday, spokesman Thomas Steg defended the government\’s reaction, saying Germany had \”not been silent\”, and that early details about the case had not been sufficiently clear for a \”spontaneous reaction\”. \”This is an abhorrent deed, one that has left us all dismayed and shocked,\” he said. He added that Chancellor Merkel would discuss the incident with Egyptian President Hosni Mubarak at this week\’s Group of Eight summit in Italy. 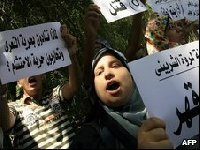 The Egyptian Secretary-General of the Arab League, Amr Moussa, called the incident a \”totally unjustified hate crime\”. \”I believe and many of us here believe that what happened is one dimension of the failure of international dialogue and the dialogue of civilisations,\” he told the BBC\’s Newshour programme.